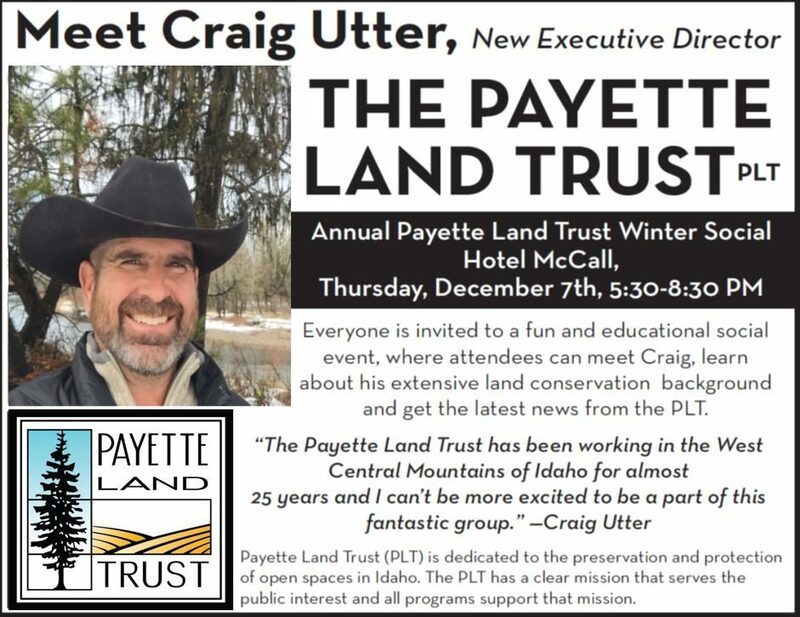 The Payette Land Trust (PLT) will be introducing their new Executive Director, Craig Utter, during their annual Winter Social at Hotel McCall on December 7th, between 5:30 and 8:30 PM. The Land Trust invites the general-public, members and non-members alike, to join them for a fun and educational social event where attendees can meet Craig and learn the latest news from the PLT. The PLT is excited to introduce a new Executive Director. “Having a dedicated staff member will help us achieve our goal of being a stronger force in the Idaho conservation community” said the PLT’s President, Rick Fereday. Craig was born and raised in the town of Evergreen on the eastern slope of Colorado, so he is no stranger to the issues faced by developing mountain towns. He received a Bachelor’s degree in Animal Science from Colorado State University and owned a 300-head cow-calf ranching operation in the Sandhills of Nebraska for 13 years. During this time, he was involved with the Nebraska Cattlemen’s Association and eventually chaired their Natural Resources and Environment Committee. Simultaneously, he became involved with a variety of private land conservation programs, most notably the Leopold Conservation Award presented by the Sand County Foundation. Craig was instrumental in bringing this prestigious national private land stewardship award to Nebraska. Much of the success of the Nebraska award can be attributed to the collaboratives he helped facilitate between private landowners and a diverse group of stakeholders. In 2006, he moved to McCall and was hired as a USFS firefighter on an engine stationed in Warren. “I thought I would fight fire for one year and then go back to graduate school” Craig said “Then I was hired on as a member of the Krassel crew and rappelled out of a helicopter. That was eleven summers ago, never made it back to school.” During his winters off from fighting fire, he continued to work with the Sand County Foundation, coordinating the Nebraska Leopold Conservation Award. Craig brings almost 20 years of environmental and conservation-based non-profit experience and a strong understanding of the importance of collaboration.